In large microwaveable bowl, microwave chocolate chips uncovered on High 1 minute, stir until melted. If necessary, microwave 10 to 20 seconds longer or until chocolate can be stirred smooth. Microwave frosting uncovered on High 20 seconds; stir into melted chocolate chips. Stir in vanilla. Cover; refrigerate 30 minutes or just until thick enough to hold a shape. Drop chocolate mixture by level tablespoonfuls onto waxed paper lined cookie sheets. Flatten each tablespoon of chocolate mixture. Spoon about 1/4 teaspoon marshmallow or creamy peanut butter in centre. 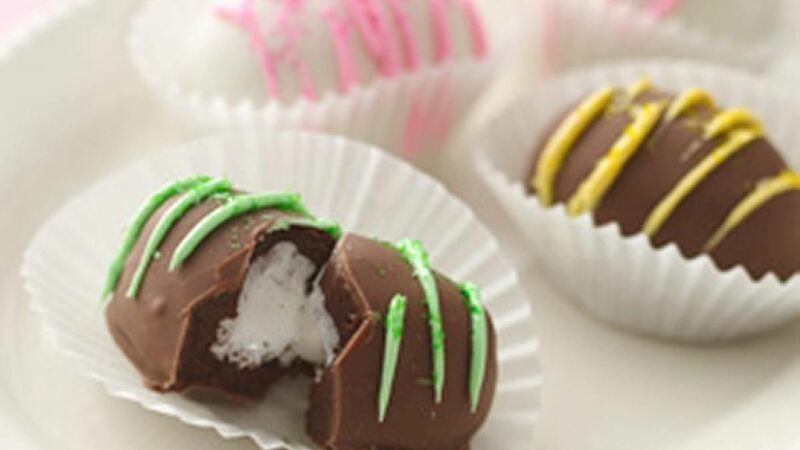 Fold chocolate mixture over filling; shape into egg shapes. (If mixture is too sticky, refrigerate until firm enough to shape.) Freeze 30 minutes. In large bowl, microwave candy coating uncovered on High 1 minute to 1 minute 30 seconds, stirring until smooth. Dip eggs, one at a time, in candy coating using fork to hold them. Return to cookie sheets. Refrigerate eggs about 10 minutes or until coating is set. Decorate as desired. Special Touch: Use your creativity to make one-of-a-kind Easter eggs.